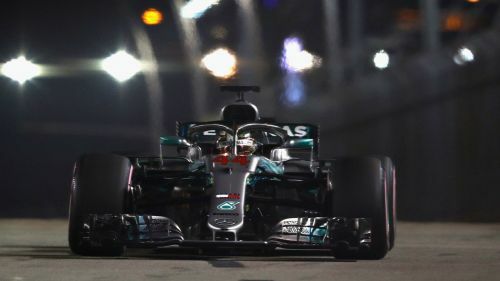 Hamilton's time of one minute, 36.015 seconds – set on his first run – was described as "a pretty epic lap" by Mercedes on team radio and was 3.4s faster than last year's pole, and did not come close to being challenged in the final runs. Good grid position is essential in Singpaore, where seven of the last 10 races have been won by the driver on pole position, a great sign for Hamilton who has already built up a 30-point lead on Vettel having won three of the last four races. Verstappen was 0.319s behind the Briton, with Vettel 0.613s back, just shading Bottas and Raikkonen in a tight battle for third. Earlier, Hamilton scraped through a first qualifying session topped by Ricciardo in just 14th place, as Mercedes gambled on using the slower ultrasoft tyres. Raikkonen was the man to come out on top in Q2. A frustrated Vettel has four wins and as many pole positions to his name in Singapore, but now has significant work to do if he is to prevent a further increase in Hamilton's advantage. "Wow, wow," said Hamilton. "That was a hard qualifying session. That lap felt like magic. I don't know where it came from but it all came together. "I don't think there was a moment in the lap that was wide or any problems. It was just perfectly to the limit. It felt like one of the best laps I remember feeling." Sergio Perez, Romain Grosjean, Esteban Ocon and Nico Hulkenberg made up the top 10, with Fernando Alonso just missing out on Q3. Haas' Kevin Magnussen was the biggest casualty of the first session, and will line up in 16th place on the grid.